I was recently installing RecoverPoint and I ran across something that I have never seen before. 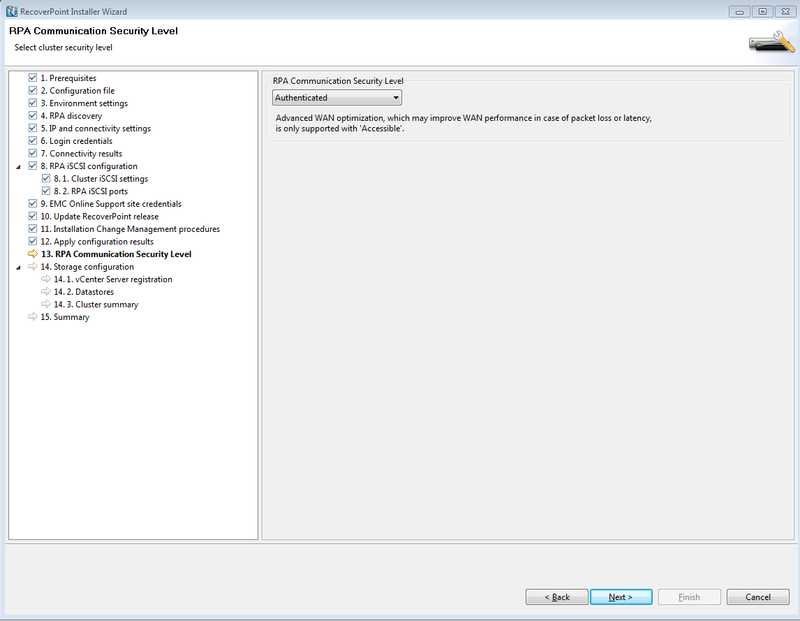 During the Deployment Manager setup step 13 is “RPA Communication Security Level”. Accessible – Communication between RPA clusters is not authenticated or encrypted. However, RPA clusters can communicate with each other only by adhering to the RecoverPoint proprietary protocol. Authenticated – RPA clusters use certificates to authenticate each other before communicating. This option minimally impacts RPA performance. Authenticated and Encrypted – RPA clusters use certificates to authenticate each other before communicating. All communication between RPA clusters is also encrypted.